Looking at the medals table of one of Japan's most expressive gymnasts might not immediately explain why Mitsuo Tsukahara is still celebrated world-wide. Numerous national championship titles, cup competitions, and world championship titles have been won by the Tokyo native throughout a successful ten-year career. He also formed part of the winning men's Olympic teams in 1968, 1972 and 1976, teams which, from 1960 - 1976, dominated the team competition. But what set Tsukahara apart from his peers was his invention of gymnastics moves which challenged the prevailing concept of the human body in full flight - attributed moves which are still widely used today. Somewhat taller than other Japanese gymnasts, Tsukahara's formative years were spent at the Nippon College of physical education. His entry into the Olympic team for the 1968 Mexico Games went almost unnoticed as he finished in 18th place (111.50 points), as part of the team which won their third of five consecutive team titles. 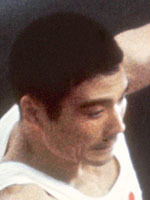 Two years later at the 1970 Ljubljana world championships, Tsukahara's fate, and fame, were sealed when, coming 2nd in the individual and 1st in the team competitions, he performed a revolutionary long horse vault - executing a half-turn before putting his hands on the front of the horse, followed by another half-turn before doing a backward somersault dismount. In Munich two years later a similarly-spectacular dismount in the horizontal bar event shocked, and moved, onlookers. Consequently, Tsukahara's name became synonymous with these two moves which, though complicated in nature, had been conceived in a primitive gymnastics environment led by the revered coach, Akitomo Kaneko. As a self-admitted "honoured" veteran of the 1976 Olympic team, Tsukahara's experience proved crucial when, with his team-mate Shigeru Kasamatsu dropping out due to acute appendicitis, he successfully completed his horizontal bar routine to earn a score of 9.9. The team, also bolstered by Fujimoto, who had bravely completed his routine with a broken knee, had needed at least 9.5 to ensure a fifth straight Olympic gold. Tsukahara competed until 1978, following which he married Chieko Oda, gymnastics Olympic team member in 1968. In time, the golf-playing coach was called upon to teach Japan's young gymnasts, including his own son Naoya, who became one of the country's brightest hopes.